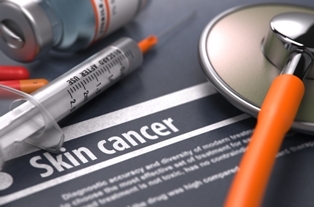 The American Academy of Dermatology reports that 1 in 5 people will develop skin cancer at some point in their lives, with 8,500 people being diagnosed each day. Although skin cancer is the most common form of cancer in the United States, the condition is often misdiagnosed. Depending upon the circumstances and the delay in obtaining a correct diagnosis, this may qualify as a form of medical malpractice. Basal cell carcinoma – The most common type of skin cancer, basal cell carcinoma is very treatable if it's caught early and will seldom spread to other parts of the body. Basal cells line the deepest layer of the epidermis, with a carcinoma appearing as a sore or lesion. People with fair skin or those who spend a lot of time outdoors have the highest risk of acquiring this cancer. Squamous cell carcinoma – Squamous cells make up the top layer of the epidermis, with a squamous cell carcinoma typically resembling a wart or sore on a part of the body that is most often exposed to ultraviolet light. This type of skin cancer is the fastest spreading, but is still considered less aggressive than melanoma. Melanoma – Although melanoma is the rarest form of skin cancer, it is the most serious. Melanomas typically resemble moles that are raised or abnormally shaped. Caucasians and men who are over age 50 have the highest rates of melanoma, but melanoma is the second most common form of cancer in young women ages 15 to 29 due to the recent rise in the popularity of indoor tanning salons. The warning signs of skin cancer can be remembered with the ABCDE rule. A=Asymmetry. If a mole or birthmark has one side that doesn't match the other, it needs to be evaluated by a healthcare professional. B=Border. Jagged, blurred, or otherwise irregular edges can be a sign of early skin cancer. C=Color. Seek medical attention if a mole or birthmark is not the same color all over, especially if it's shades of brown and black with hints of pink, red, blue, or white. D=Diameter. Any spot larger than a pencil eraser should be evaluated as a precaution. E=Evolving. Changes in moles and other skin spots should be taken seriously, especially if they itch, bleed, or cause any pain. Sores that don't seem to heal should also be evaluated. The doctor fails to refer a patient to a specialist with additional training in spotting skin cancer. The doctor assumes cancer isn't a possibility because of the absence of a genetic history and other risk factors. The doctor doesn't take the time to complete a full medical exam and additional diagnostic tests. Although it's understandable to be angry if your skin cancer was initially misdiagnosed, not all cases of misdiagnosis qualify as malpractice. To be eligible for compensation under malpractice laws, you must prove that a reasonable care provider would have correctly diagnosed your skin cancer and that the delay in diagnosis caused verifiable and significant harm. If your skin cancer was correctly diagnosed in the early stages and your treatment options were not affected, your care provider would not be guilty of malpractice. However, a longer delay that worsened your progress may lead to a malpractice claim. Compensation in a malpractice case can include reimbursement for medical costs, lost wages, and pain and suffering. A skilled attorney can explain what types of compensation you may be eligible to receive based on the circumstances of your case. The legal team at the Inland Empire Law Group has extensive experience handling malpractice claims and can assist patients who've received a skin cancer misdiagnosis. Call (888) MY IE LAW to schedule a free, no-obligation consultation at our offices in Rancho Cucamonga and Victorville. How Long Do I Have to File a California Medical Malpractice Claim? 1Steps to Take if You Think You Have a Malpractice Claim 2California Law Limits Medical Malpractice Compensation 3How Do You Prove Negligence or Malpractice? 4How Long Do I Have to File a Malpractice Suit? David Ricks is very knowledgeable and I would recommend his office to anyone requiring legal counsel. Lisa N.
?When it comes to retained surgical objects, what is classified as a foreign object? ?Prescription drug costs are rising all the time. How do I know my settlement will be enough to pay for the future costs of my medications? ?Can I sue for objects left behind after surgery?